Walter Bedford Lowe, Jr. Army - Rank SSGT. He was born Feb 3, 1947 to Martha C. Bryan-Lowe and Walter B. Lowe, Sr. He grew up in Garden City, TX and was assigned as squad leader to D Company, 2nd Battalion 503rd Infantry Regiment, 173rd Air Borne Brigade. He was killed Sept 16, 1969 by explosive device in Pleiku, Vietnam. This Vietnam Era Veteran is listed on the Veteran's Memorial in Graham, Young County, Texas. This additional information was supplied by family and we thank them for their addition and this veteran for his service and ultimate sacrifice. Awards and decorations bestowed on SSGT. Lowe included Combat Infantryman’s Badge, Parachute Wings, Bronze Star, Purple Heart, National Defense Service Medal, Vietnam Service Medal, Vietnam Campaign Medal. Walter married Lucretia Ashley of Graham, Texas while on leave prior to departing for Vietnam. The ceremony was held in Graham on April 19, 1969. His funeral service was held in Graham and he was buried with full military honors in the Fairmont Cemetery in San Angelo, Texas. He was posthumously promoted to Staff Sergeant and received the Bronze Star and Purple Heart. 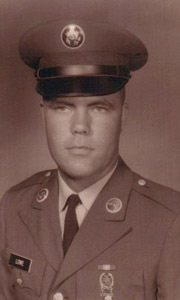 He was drafted into the Army in January, 1968. He completed basic training at Fort Bliss, Texas, AIT at Fort Ord, California. He was selected for the Non Commissioned Officer Candidate’s Academy at Harmony Church at Fort Benning, Georgia, Class 9-69. He graduated on November 26, 1968 and received a promotion to Sergeant E-5. He then completed jump school at Fort Benning, Georgia and other leadership schools at Fort Polk, Louisania and Fort Ord, California enroute to Vietnam. He began his tour on May 5, 1969. Walter married Lucretia Ashley of Graham, Texas while on leave prior to departing for Vietnam. The ceremony was held in Graham on April 19, 1969. His funeral service was held in Graham and he was buried with full military honors in the Fairmont Cemetery in San Angelo, Texas. He was posthumously promoted to Staff Sergeant and received the Bronze Star and Purple Heart.